Unit pricing is supposed to help people make informed decisions about the price difference between options. It is irritating enough when the unit price for a “value” or “saver” size is higher than the regular size. But at least the shopper who is paying attention can readily identify the deception. More troublesome is looking at a group of products and finding that their unit prices don’t use a consistent unit. For example, I’ve looked at cereals and had some brands give a unit price per ounce and others per pound. Worse, I’ve seen volume and weight measures used on similar products. Clearly such a store doesn’t want me (the consumer) to have an easy path to understanding the relative prices of those items. In this case the unit price is just plain wrong. 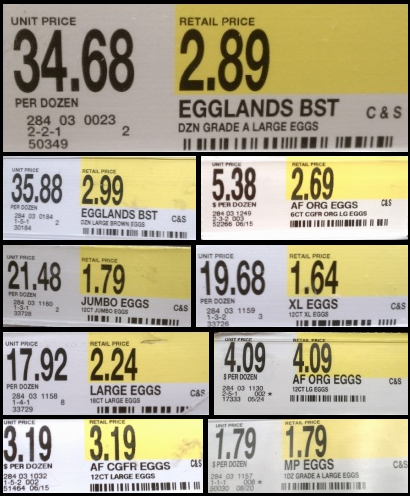 It cannot be used in any way to compare the relative prices of the eggs since the error isn’t consistent, creating some sort of shell game. In several cases the unit price is correct, in others it is off by 12 (treating the price for 12 eggs as if it were the price for 1). In one case the error is a factor of 8. Where did they come up with 8? Being both amused and frustrated by these errors, I’ll be taking a closer look at unit pricing at a variety of stores just to understand the reliability of these “consumer aids.” It will be interesting to compare the results between retail chains as well. Anyone out there ever use unit price information when choosing which product to buy? Ever found errors or confusing unit pricing schemes being used? This entry was posted on Monday, September 3rd, 2012 at 23:14	and is filed under Consumer, Quality. You can follow any responses to this entry through the RSS 2.0 feed. You can skip to the end and leave a response. Pinging is currently not allowed.